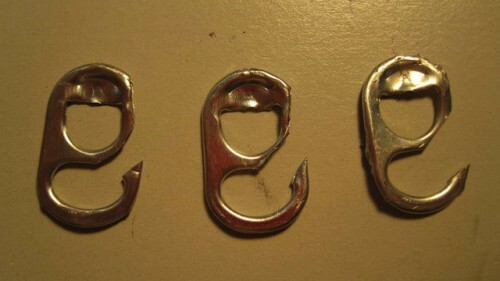 Turn a Can Tab Into a Fish Hook | FISHING FURY - A Fishing Blog with Attitude! In case you are in need of more excuses to drink, I present to you, the tab hook. Now I know a lot of you like to drink beer from a bottle like a baby, but you are doing it wrong. A true fisherman drinks from a can, and this is why. Sure you cold fashion a fish hook from a beer bottle cap, but its way easier to do it with a tab from a can, just ask Instructables! A couple more great reasons to drink from a can instead of a bottle. 1) if you accidently drop it, theres no glass to clean up. 2) cans crush down easily take up no space and weight almost nothing, which makes it harder to litter when it’s so easy to clean up. Didn’t know about #3 – Thanks!